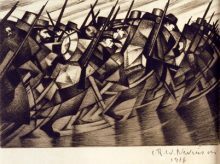 The powerful art and contradictory personality of British war artist Richard Nevinson will be explored in this ground breaking exhibition – the centrepiece of our autumn programme. 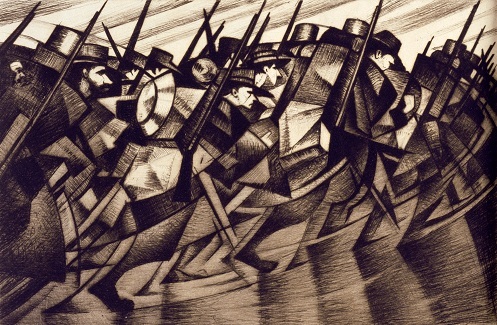 Famous for his dramatic, often haunting images of the battlefield and its soldiers, Nevinson’s arresting paintings, drawing, prints and posters also acknowledged the sometimes unpalatable effects war had on British society. Always a rebel, he produced work that ranged in variety from official war propaganda to anti-war condemnation – some of which was censored. 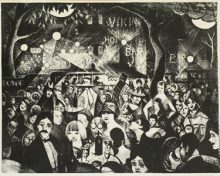 With major paintings and key drawings and prints lent by major UK public and private collections, including Tate, the Imperial War Museum and the British Museum, this exhibition will be accompanied by a full programme of related lectures, talks and other exciting events. Please click here for a press release and find opposite a gallery of images for press use . For all press enquiries, please contact Andrew Davies, Communications & Marketing Manager on 0121 414 2946 or andrewdavies@barber.org.uk. Image above: CRW Nevinson, ‘A Star Shell’ (detail), about 1916. © Tate, London.